- Do the entire instrument (fretboard, headstock, front. sides, back, pickguards). - Lubes and restores strings. - Comes in a generous 4 oz. oval shaped bottle with an applicator flip top cap. - Helps prevent fret oxidation. - U.S. made with U.S. materials. - Not an aerosol spray - safe for the ozone. - Bar coded for retail scanners. 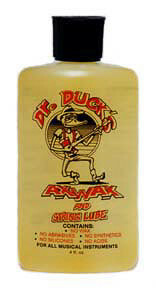 - Cleans and lubes bridge saddles and fine tuners on locking tremolo systems. - Lubes tuning machine knobs and posts and strap locks..
- A MUST to protect your instrument in all climates - dry or humid. - Compliments and enhances the natural beauty of your instrument.